Team building can help bring out the best in your group, whether through building essential leadership skills, bringing together two different corporate cultures, or trying to bridge differences in thinking or problem solving. But while many teams are already synchronized, there are other groups who need a little more of a hand to get started, and while there are many pros to bringing your team together, for some other groups, those same techniques could be detrimental. That’s why we build each event based on the goals and needs of each individual group, never following a set format or a template, but instead, working off the personalized goals that each team requires. 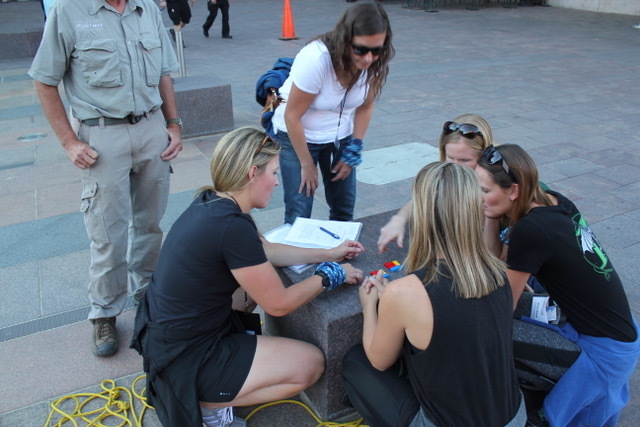 We’re going to explore some of the pros and cons of corporate team building and how Colorado Wilderness Corporate And Teams uses a customized method to help bring out the best in your group. Especially for teams who are coming from two different corporate cultures, a shared experience gives teams a collaborative moment to talk about, and an experience that they’ll be able to revisit together. But for some teams it isn’t that easy. With two companies who are coming from competing cultures, potentially one that’s more lax than the other, then it takes more work to break down the key differences in two groups, often trying to find the right balance between business and playfulness. If it’s uniform than it’s difficult to find the subtle differences that break down two teams, and it takes a specialized activity to bring them together. So the crucial aspect of a shared experience, with our facilitators, is building teams through specialized and individual activities that reveal, and soften or harden two different groups. One of the most crucial aspects for any team is learning to communicate effectively, especially without negatively judging someone else for their pattern of thinking or their style of leadership. One of the most important aspects of team building is to teach effective communication without judging others for what they or don’t say, and in this, during the planning process of the event, it takes careful consideration to evaluate words and gestures and find a medium that incorporates both in a way that builds more effective team communication. For some teams who still don’t know each other well, it takes a special form of communication and understanding to get to the root of that team’s culture, and in building a team building activity, teams learn to utilize each other’s individual skills and talents to build a better form of communication with each other. In working with a group that incorporates multiple departments or multiple functionalities, incorporating a cross-function collaboration element helps teams to build individual skills and learn to crossover from one department to another effectively, giving the ability to help one member of the group understand another’s responsibilities and job, making for clearer understanding between parts of the organization. In working with a group that might not understand the functionality of another department, and risk labeling it as ‘extraneous’, one of the ways to help other teams engage with each other is to help them ‘walk a mile in someone else’s shoes’ and help them understand the intricacies of different areas by incorporating elements and parts of their style of leadership into the overall event. This helps others get a better grasp of the functionality of each group. Being able to include others of different ability levels is important for any corporate culture, as it allows teams to function in a more open and able manner. This includes veterans working with newer members of the teams, those who operate with a different style of leadership and work ethic, and those who believe in a more traditional manner of operation. Inclusivity is important because it allows every member of the team to feel value and welcomed as well as sharing ideas, interests, passions, and innovations, which keep the group operating in a functional manner, as well as allowing individuals to express themselves freely without feeling judged or excluded from the more senior members of the organization. In working with inclusivity, teams are able to feel more functional and efficient, allowing for a more open and caring work environment. With many teams, one problem that may be facing the organization is that there’s one person who runs the show, or one leader, who is afraid to embrace change or different ideas, which may lead to a different pattern of thinking and different style of leadership that a existing or new group might now be accustomed to. Change is important because it moves the business forward, and allowing others to provide input helps the business and it’s leaders think in a different manner, whether it be more progressive or traditional thinking. What a team building activity allows members to do is to see the kind of change that other members, especially new members, are capable of producing, and allows senior members to see what a team see what the new or integrated employees are bringing to the company. Team building is a delicate dance of merging styles of leadership and different patterns of thinking into one event, which helps bridge differences between traditional and progressive thinking, and help develop new idea. But not all team building is alike, and what might work for one team may not work for another, thus it’s important to treat each event and team individually, letting them think and act for themselves. To find out what Colorado Wilderness Corporate And Teams can do for your organization, and help bring out the best in your team, call us at 720 242 9828 or visit www.coloradocorporateteambuilding.comto find out what kind of project we can organize for your team.